By courtesy of the Sammy Miller Museum, two of the most technically complex 500cc motorcycles ever built in Britain, the 1939 AJS V4 and 1947 ‘Porcupine’ road racers, will be on show at the Carole Nash International Classic Motorcycle Show at the Staffordshire County Showground on April 22/23. Sammy demonstrates the ‘Porcupine’ at the 2007 Goodwood Festival of Speed. In 1935 the Wolverhampton manufacturer, always innovative and keen to gain publicity, and among the first to produce overhead-camshaft engines, unveiled a sensational super-sports V4 motorcycle with pairs of light alloy cylinder barrels arranged side-by-side on a common crankcase, and overhead camshafts driven by a chain between the cylinders. Although these machines could be normally aspirated or supercharged, at first they were not especially successful in either guise. After a further year of development, the supercharged V4 reappeared with plunger rear suspension, and while they showed potential, they had a tendency to overheat. This problem was solved by the introduction of water cooling in 1939 and, ridden by Walter Rusk in that year’s Ulster Grand Prix, the Ajay lapped the circuit at 100mph. The intervention of the Second World War brought the V4’s glory days to an end, because when motorcycle racing was finally re-established, supercharged machines were banned. The Sammy Miller Museum’s restored example is the only genuine and complete AJS V4 racer in the world. After the war, AJS’s next sensation was a simpler parallel twin with gear-driven overhead camshafts, and because its cylinders were laid flat, reducing its frontal area and lowering the machine’s centre of gravity, water-cooling was unnecessary. The cooling fins were aligned with the airflow for maximum effect, and the spiky appearance of the cylinder head gave rise to the racer’s ‘Porcupine’ nickname. Sadly, the supercharging ban denied this brilliant design its full potential, but even so, one of these machines ridden by Jock West set the fastest lap in the 1947 Senior TT before clutch trouble intervened. 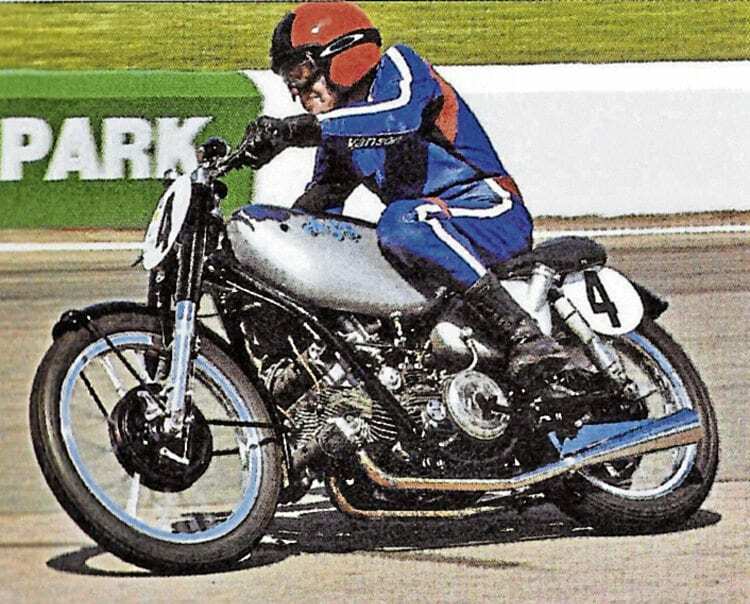 On a similar machine, Les Graham won the 1949 500cc World Championship but suffered cruel luck in that year’s Senior TT, being well on his way to victory until a magneto failed on the final lap. The museum’s ‘Porcupine’ is the world’s only working example of this innovative machine.